Does a Bachelor’s Degree Pay? The bachelor’s degree is widely considered to be the most common degree sought by high school graduates preparing for lifelong careers, and can lead to greater earnings, increased job security and more employee benefits. Online learning presents an accredited college option for students who can’t afford tuition, aren’t close to a college campus or want an accelerated, self-paced program that shortens the time to graduation. It is often the case that attending class in-person simply isn’t an option, as many of life’s obligations are time-consuming and demand more immediate attention. However, students who may be working around these scheduling constraints may be pleased to hear they can complete the entirety of their bachelor’s degree online. Online learning allows students to make the necessary time to earn a college degree, without disrupting their already busy schedules. To help students find the best learning options for them, we've ranked schools across the country based on factors such as class size, program count, and institutional financial aid opportunities. Explore the top schools with online bachelor's programs below. The University of Central Florida offers 20 fully online bachelor's degree programs, plus 33 minors, all taught by the same full-time faculty members as the school's on-campus courses. Online bachelor's degree options include anthropology, health services administration, international and global studies, psychology, and technical education and industry training. Technology used to teach online courses runs the gamut from live streaming video to online labs to smartphone apps. Services available to online learners include academic advising, career placement assistance, financial aid services, access to digitized library materials, success coaching and live tutoring. Students seeking a bachelor's degree must earn a minimum of 120 credit hours, including 36 hours of general education coursework and 48 hours of upper division coursework, in addition to major-specific requirements. Online students receive a waiver for some campus-based fees such as activity, transportation, health and athletic fees. UCF is accredited by the Southern Association of Colleges and Schools Commission on Colleges. Students interested in the University of Alabama can choose from 13 online undergraduate degree programs in arts and sciences, commerce and business administration, engineering, human environmental sciences and nursing. Most degrees in the school's "Bama by Distance" program are fully online and require 120 credit hours for graduation. Some programs, however, do have some in-person requirements. The mechanical engineering bachelor's requires 128 credit hours and occasional in-person lab hours. For the RN to BSN program, nursing courses and the core curriculum are online and clinical activities can be completed at facilities close to home. The same instructors who teach on campus, interact with students via Blackboard Learn. Some lectures are offered through video streaming. Students can find a list of designated core curriculum courses and required prerequisites through the registrar's office. The Bama by Distance Student Services Team supports online learners throughout their programs, providing help with everything from admissions to applications to financial aid. Other services include online library resources, tutoring assistance and technical support. The University of Alabama is accredited by the Southern Association of Colleges and Schools Commission on Colleges. The University of Florida offers 18 online bachelor's programs, including anthropology, computer science, environmental management, fire and emergency services, public relations and sports management. The majority of UF online courses are asynchronous, so students can watch lectures and complete assignments at their convenience. Most programs are fully online, but there are some exceptions. As an example, the microbiology and cell science degree requires 2 in-person lab courses taught in accelerated 5-day cycles. Online students have access to support services including career counseling, skill enhancement, resume and interview preparing, and virtual job fairs. Eligible online students can be considered for a range of federal, state and institutional aid through the Office for Student Financial Affairs. UF is accredited by the Southern Association of Colleges and Schools. Additionally, various programs have accreditation from bodies such as the Association to Advance Collegiate Schools of Business, the American Council for Construction Education and the Commission on Collegiate Nursing Education. Bachelor's degree options abound at Liberty University, which offers 31 online bachelor's degree programs in 11 different areas - aviation, behavioral sciences, business, divinity, education, arts and sciences, government, law, music, nursing and visual arts - as well as more than 2 dozen minors. Liberty's online degree programs are taught in a flexible virtual classroom environment, allowing students to complete assignments when convenient. Coursework is completed through the Blackboard classroom management system. Most classes are 100 percent online, 8 weeks long, and have no set log-on times. Some are 14 or 17 weeks in length and a few programs require minimal 1- or 2-week on campus stays. All students have access to a digital library, online study aids, writing resources, and technology support. Degree completion time depends on the chosen program and the amount of transfer credits a student has. Students are able to transfer up to 75 percent of previously earned credits. Liberty is accredited through the Southern Association of Colleges and Schools Commission on Colleges. Additionally, many of Liberty's programs are accredited by other agencies, including the Accreditation Council for Business Schools and Programs, National Council for Accreditation of Teacher Education and Commission on Collegiate Nursing Education. Harvard University Extension School, 1 of 12 degree-granting institutions at Harvard University, offers a Bachelor of Liberal Arts for students who want to complete their degree part-time, both on campus and online. Degree concentrations can include humanities, science or social sciences. Students must complete three stipulated degree courses before submitting an admission application. Once accepted, classes can be taken in the fall, spring or summer, and students are required to take at least 16 credits on campus. Intensive 3-week and weekend options are available. Extension School students can find academic and career services assistance on the school's Resources page and financial aid information through Student Financial Services. Harvard Extension School is accredited by the New England Association of Schools and Colleges. Students can choose from 35 fully online bachelor's degrees at Pennsylvania State University. From traditional liberal arts to technical specializations, programs include agribusiness management, digital multimedia design, economics, international politics, software engineering, and turfgrass science. Penn State calls itself a pioneer in delivering education at a distance, since it began offering correspondence courses in 1892. Courses are taught by faculty members experienced teaching in an online environment and are academically equal to those taught on campus. Courses are asynchronous, so students can complete most programs at their own pace. While students do not have to attend classes at a specific time, they must complete assignments and exams by specified due dates. Online learners stay connected with other students through chat, video conferencing, social media, and online bulletin boards. A syllabus distributed at the start of each course provides an overview of assignments, grading strategy, student and faculty expectations and course materials. Students typically spend 8-to-12 hours a week on readings and assignments, plus additional time for papers, projects or exams. Time for degree completion depends on factors such as transfer credits and course load. Online students have access to the same support services as students on campus, including a new student orientation, academic advising, career counseling resources, research library, technical support and tutorials. PSU has different payment options to help students pay for tuition and other student fees. PSU is accredited by the Middle States Commission on Higher Education. Many individual programs have additional accreditations through governing bodies in their fields. online undergraduate degrees and 15 minors in 11 different areas, including business administration, criminal justice, data analytics, humanities and social sciences. A full-time student typically carries 12-15 credits per semester. Courses are taught by faculty members through the Blackboard learning management system and students can log on for lectures and assignments at their convenience. Time for degree completion varies according to the number of transfer credits, how many credits a student takes each semester, and the degree. A maximum of 90 semester hours or 135 quarter credits may be eligible to be transferred to WSU toward a bachelor's degree. Each online student is assigned an academic advisor for assistance from enrollment to graduation. The school also offers online students 24/seven tech support, a student services staff, free online tutoring and writing labs, and a student government for online students. WSU's New Student Center website contains a wealth of information on technical requirements, courses, academic advising, tuition and financial aid, study tips and graduation requirements. Washington State University is accredited by the Northwest Commission on Colleges and Universities. Additionally, many undergraduate programs maintain accreditations through discipline-specific organizations. Learners looking to earn a bachelor's degree will find 40 online programs at Florida International University, including Asian studies, computer engineering, international relations, public administration and women's and gender studies. Students should plan to spend 8-12 hours a week on a 3-credit course. The length of time to compete a bachelor's degree depends on how many courses a student takes a semester. Some programs offer accelerated options for faster completion, while others are cohort-based, so all students move through the program on the same schedule. Courses are not self-paced; thus, all assignments and exams must be completed by their due dates. The school's learning management system enables online students to log into classrooms, receive and submit assignments, review grades, interact with faculty and other students, and collaborate virtually. FIU offers a guide to help students through the application process as well as counseling from success coaches and 24/7 live tech support. An online orientation session welcomes students with information on financial aid and available online resources such as libraries, and career and counseling services. Online students are encouraged to connect with their peers through academic organizations; social, political, cultural, and spiritual clubs; the school's sorority and fraternity community, and its alumni network. FIU is accredited by the Southern Association of Colleges and Schools Commission on Colleges. Various colleges within the university are accredited individually by bodies such as the Association to Advance Collegiate Schools of Business, Council for the Accreditation of Educator Preparation and Council on Education for Public Health. The University of Illinois Springfield offers 13 undergraduate online degree programs, including business administration, computer science, English, management information systems, political science and teacher education. Graduation requirements vary by program. Depending on the program, online courses can involve a variety of tools, methods and strategies to present content. This can include books, hard copies and digital, websites and simulations, videos, asynchronous discussion forums and synchronous web conferences. Most UIS online classes are capped at 25 learners so students and faculty can develop relationships over the 15-week semester. Classes are taught primarily by full-time faculty, often the same who teach on-campus versions of the courses. The school's Career Development Center offers a range of services and resources to online students, including distance career counseling and career document critique, remote career fair participation and access to online systems to explore majors, career planning and jobs, and internships. UIS also offers online students their own program coordinator, who serves as their contact for support and informal advising. The school's Learning Hub offers free academic support services through online supplemental instruction and peer tutoring in writing, math, statistics, accounting, economics, science and academic/study skills. UIS is working to make its online courses and digital content accessible and ADA compliant. In the Fall 2017 semester, 1,681 students from 48 states were enrolled as online students at UIS. The university is accredited by the Higher Learning Commission. online bachelor's degrees in criminology, educational studies, general studies, management, and religion and global society. It also offers 3 online bachelor's degree completion programs in data analytics, media communications and RN to BSN. Most programs require 128 credit hours. Courses are offered in 8-, 9- and 16-week formats and programs are generally completed within 1-4 years, part- or full-time. Students should expect to invest 15-20 hours per course per week. Courses are optimized for online learning and delivered by the same faculty as in the classroom. Each online course meets the same academic standards as the school's traditional classroom programs. Webster uses an asynchronous format, so learners participate in class activities and complete assignments at their convenience, but with scheduled due dates. Advisors assist new online students with registration, degree requirements and academic policies. Online students are also eligible for peer tutoring, writing assistance and career assistance. Online transfer students must be on track to complete a minimum of 64 undergraduate credit hours before transferring into their program of choice. The school is committed to helping students, including online students, secure loans and other financial aid. Webster is accredited by the Higher Learning Commission. At Northern Arizona University, students can enroll in an online bachelor's degree program in arts and humanities, business and administration, computing and technology, education and counseling, health professions, math and science and social science and criminal justice. Incoming freshmen need to have a GPA of at least 2.5 and should have completed required coursework prior to applying. Students who decide to pursue an online bachelor's degree can expect to take courses through Blackboard Learn, which allows students to view lecture presentations and participate in discussions with professors and classmates. Since most online courses at Northern Arizona University are asynchronous, students can log in and attend them at times that are convenient for their schedule. Those who enroll in an online bachelor's degree will receive access to 24/7 IT support in the fall and spring semesters as well as online library resources such as journals and e-books. In addition, they can take advantage of campus resources such as tutoring and computer labs at any time. University of Wisconsin-Stout offers 15 bachelor's degrees that can be completed online. Degree programs include technical education and training, human studies and several business-related degrees. Incoming freshmen should submit high school transcripts and either ACT or SAT test scores along with their applications. All online students work with an adviser and program director throughout their time at University of Wisconsin-Stout. They are also given access to a support team that assists with billing, financial aid and library needs. Additionally, the University offers free tutoring and writing labs. Since over 99% of online students at University of Wisconsin-Stout are transferring credits from other institutions, there are transfer advisors available to explain which credits are transferable. There are a wide variety of bachelor's degrees at Robert Morris University that can be completed entirely online. Students can study business, hospitality and tourism management, nursing and criminal justice, just to name a few. Most of these 4-year degrees are 120 credit hours and include a blend of major, core and elective courses. Robert Morris University provides each online student with a student counselor, career adviser, financial aid counselor and wellness adviser. Each student also receives access to 24-hour tech support. Admission preference is given to students with a minimum GPA of 3.0 and an ACT composite score of at least 22 or an SAT score of 1080 or higher. Students who would like to transfer to an online bachelor's degree at Robert Morris University are required to submit official transcripts from every post-secondary institution they attended and are encouraged to schedule an appointment with an admission counselor to determine which credits can be transferred. After completing a minimum of 24 college credits, students at Bemidji State University can start a fully online bachelor's degree program. 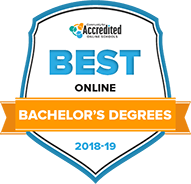 Designed as degree-completion programs for students holding an associate degree, Bemidji's 6 online bachelor's programs can be earned in accounting, psychology, marketing communication, engineering, management, business or criminal justice. 7 online minors are available in areas including fraud examination and geography. While these programs are geared towards students who have earned around 60 college credits, the university is usually able to accept those with only 24 credits into a program. To gain acceptance, applicants need at least a 2.0 GPA. All online students at BSU pay the same tuition price, with rates per credit hour at $315. To help cut the cost of college, students can apply to the university's scholarship programs and federal financial aid. Currently, BSU has 5 scholarships created for online learners. At the University of Minnesota Crookston, bachelor-degree seekers can complete 1 of 16 programs online without ever coming to campus. Students can earn a degree in areas such as accounting, health management, business, english and IT management. The university also has 11 fully online minors to choose from, which are offered in related fields. These online bachelor's programs follow traditional 15-week spring and winter semesters, with an 8-week intensive summer session option. Courses are designed for students to study independently, with all class information at their fingertips. Online students have a scholarship opportunity at UMC and are eligible to apply for all other financial aid. Tuition rates for students varies based on how many credits are taken each semester; however, online students can expect to pay around $445 per credit. To be guaranteed admittance to UMC, students need a minimum 2.75 GPA and ACT scores of 20 or higher. The university still considers students with 2.0 GPA after reviewing other factors. Missouri State University provides 9 bachelor of science degrees online in disciplines such as writing, hospitality, finance, criminal justice and psychology. Some programs, such as the communications studies option, require students to pair their major with a minor to graduate. To complement these programs, MSU offers 12 subject minors that can be fulfilled completely online. Minors are offered in various subjects such as screenwriting, sociology, religious studies and history. Admission criteria varies for each online bachelor program; for example, to enroll in the online business major, students need a 2.5 GPA and several prerequisite courses completed. Online students at Missouri State benefit from the same support services as on-campus students, with career and technical services and financial help all available online. Online undergraduate education at MSU is offered at the same tuition price for all students at the affordable rate of $295 per credit hour. These students are also eligible to apply for scholarships and financial aid. With both traditional and degree-completion programs available, students at Old Dominion University can finish their bachelor's degree online with no previous college credit or with some credit already earned. For first-time students, ODU has 12 undergraduate programs in areas such as communications and management that can be earned fully online at the junior and senior levels; although, the university advises some lower-level courses may not yet be offered online. For students who have already earned at least 60 credits, ODU has 37 bachelor-completion programs, spanning diverse subject areas. Old Dominion also has a transfer agreement with all Virginian community colleges, guaranteeing acceptance to a bachelor program for all community college students. Freshman students need to apply with their high school transcripts and either SAT or ACT scores. Online students have access to the same student resources provided on campus such as financial aid assistance, academic advising, tech support and networking opportunities. Tuition for Virginia residents if offered at a slightly lower rate than out-of-state students. Students at Minot State University can earn a bachelor's degree completely online through 1 of 9 programs. The university offers 1 nursing degree-completion program for current RNs plus 8 traditional degrees in business, information systems, criminal justice, marketing, human services and general studies. In spring 2019, MSU will offer a degree-completion program in criminal justice, partnered with the United States Air Force. The program is designed to help active duty military members earn their bachelor's degree while serving the nation. While distance learning students are not required to come to campus, online courses at MSU can be both asynchronous and synchronous, so time commitments may be required. Online students can apply for financial aid and receive an affordable tuition rate of $294 per credit hour. This rate is applicable for all students, no matter where they live. To apply to MSU Online, high school students need to submit their SAT or ACT scores and transfer students need 24 college credits with a 2.0 GPA. With 30 undergraduate programs, Troy University has a wealth of online bachelor's degrees for students to choose from. From history and anthropology to management and marketing, a variety of programs are available with specializations offered in many subject areas. The most popular online bachelor's degree programs at Troy are criminal justice, computer science, sociology and psychology. To start a program, both first-time and transfer students need at least a 2.0 GPA on their recent transcripts, and high school applicants should have a minimum ACT score of 20 or SAT score of 1030. Transfer students can see how their earned college credits stack up at Troy for free through a comparison program offered by the university. All undergraduate students receive a competitive tuition rate of $338 per credit, with additional financial aid services available. Troy also has special assistance programs for military families, with a $250 tuition rate for active military and 25 to 50% discounts available for family. At the University of Nebraska Omaha, online students take courses developed by the same faculty instructing campus-based classes, ensuring no difference in the type of education received. Courses are delivered through Canvas and students have access to all course materials, discussions and assignments through this platform. The university provides 2 types of online bachelor's degree programs: traditional, 4-year programs and a multidisciplinary degree created for students with previous work or educational experience in a field. Traditional bachelor's students can earn their degree online in 1 of 7 available disciplines: sociology, criminology, religious studies, library science, emergency management or information systems. The online bachelor of multidisciplinary studies degree can be completed in 13 different sectors and is ideal for veterans or active military students, adult learners and others with college experience. Online tuition at UN is more affordable for in-state residents and varies by program. Resources available for online students include tutoring in writing, math and science, financial aid assistance, and technical support. Undergraduate students have 10 online bachelor's degree programs to choose from at Concordia University Wisconsin in subjects such as accounting, human resources, health care management and business. These programs are structured as accelerated degree programs, with courses lasting from 6 to 8 weeks. In addition, 2 bachelor of science degree-completion programs are available in radiology and sonography. Depending on the program, classes may be held asynchronously or in real time. To be admitted into an accelerated undergraduate program at CUW, students need at least a 2.5 GPA on relevant high school or college transcripts and a score of 18 or higher on the ACT exam. All online students enrolled in a bachelor program are eligible for the same tuition rate, around $483 per credit. Special scholarships are available for adult and other "non-traditional" learners studying online and can be applied to individual 3-credit courses. At Wichita State University, undergraduate students can earn a bachelor's degree entirely online in several fields with the support of a trove of online student resources. To help online students stay on track and get the assistance they need, WSU provides services such as web course orientation, 24/7 virtual bursar office, library, writing center and career development. Wichita State offers 9 online bachelor's degree programs in fields such as criminal justice, management, business, education and general studies. Two online programs -- nursing and dental hygiene -- are designed for current RNs and RDHs to advance their knowledge and skills and can be completed within 3 to 4 semesters. All other online bachelor's programs are standard, requiring around 4 years of study for completion. Tuition for online degrees varies by program, averaging between $300 to $360 per credit with 1 rate offered to both and in- and out-of-state residents. Students hoping to complete their bachelor's degree online have 20 degrees to chose from at Oregon State University, including 3 foreign language programs. Offered through OSU's Ecampus, undergraduates can complete their degree in diverse subjects ranging from environmental science and natural resources to business and economics. Online courses at OSU are asynchronously designed, giving students the freedom to study from anywhere and at any time. Many courses are collaborative and give students the opportunity to interact in real time with fellow students and get individualized advising and feedback from instructors. Some online majors, such as horticulture, require experiential learning, which means students must complete an internship or practicum face-to-face. All online undergraduate students receive the in-state tuition rate of $297 per credit, with business and engineering programs charging a slightly higher fee. Oregon State has 4 start dates each year for students to begin their online bachelor's degree. National University is considered the flagship institution of the National University System of nonprofit colleges and offers over 70 online bachelor's degree programs. Areas of online study fall into the categories of business and marketing, allied health, nursing, social science and psychology, engineering and technology, criminal justice and law, arts and humanities and science and math. Graduation requirements vary from program to program and may include a specific amount of credits completed at National for transfer students, a capstone project, lab work, internship, field work or practicum. A unique feature of National is the 4-week course format, which was designed with military students in mind, to help manage disruptions while on active duty. With a veteran-founded background, NU strives to make the college a top military-friendly school, with other resources such as a military tuition discounts for active military and dependents and acceptance of non-traditional credits and military training towards degree completion. The online bachelor's degree programs offered at East Carolina University are degree completion programs, and are open to eligible transfer students with prior college credits. Degrees in business, communication, education and industrial technology are offered online, with programs in areas such as general business, management, early childhood education, health information management, information and computer technology and Nursing RN to BSN. Programs typically require around 120 credits for graduation and may include practicum and internship components. Length of programs vary based on amount of credits transferred and pre-requisites completed. Admission is competitive, with a cumulative GPA of at least a 2.0 required. Students can work with advisors to make sure all admission criteria are met, which varies based on program chosen. Additional student support along with specialized Career Services are also available to online students and include virtual workshops and resume reviews, interview practice, appointments with advisors via phone or Skype and access to Handshake, an online job and internship database. Bachelor’s degree programs, both online and on campus, provide students with a comprehensive arts and sciences education as well as concentrated studies in their major field. They typically take four years to complete. Bachelor’s of Arts (B.A.) A four-year degree program with major concentrations in arts, fine arts, social sciences, and humanities. Bachelor’s of Science (B.S.) A four-year degree with concentrated major studies in mathematics, physical and life sciences. Courses of study are commonly divided into lower- and upper-division segments. During the first two years, students complete lower-division general education classes. They're also introduced to their major and minor fields of study. The second-two years are comprised of upper-division courses providing intermediate and advanced studies in major fields. Students typically progress to upper-division courses after satisfying pre-requisites. During their final semester, students may undertake internships or complete senior projects. Survey in Biology Introduction for non-science majors includes overview of life processes and fundamental concepts in biological science. Requires laboratory hours. English Composition Students learn a variety of college research and writing modes, with an emphasis on organization of ideas, written drafts and revisions. Computer Science Fundamentals This foundation course for computer science majors introduces theories and designs for employing algorithms and programming languages. Pre-requisite: Math 101. Introduction to Psychology What are the fundamental concepts, principles and methods of psychology? The course covers topics in sensory perception, personality, emotional health, abnormalities, and coping strategies. Contemporary Global Challenges and Issues Intermediate studies in political culture, world opinion, and the role of peacekeeping institutions. Topics include global warming, nuclear proliferation, starvation, energy policy, and humanitarianism. Principles of Criminal Investigation Examination of techniques and theories in the detecting, preserving and presentation of physical and forensic evidence. Includes laboratory sections. Prerequisite: Introduction to Criminology. Race, Gender and Class in the Media Offered jointly by the Departments of Communication and American Ethnic Studies, this interdisciplinary course investigates the use and perpetration of stereotypes by media organizations and resulting influences on public opinion. Early Childhood Curriculum Focuses on evidence-based models for designing and implementing programs supporting early learning, including topics in cognition, literacy, social development, and special populations. Advanced Business Administration Third in a series of studies in accounting, business organization, business law, ethics, international commerce, information systems, marketing and finance. Undergraduate Independent Study in Urban Planning Students are mentored in an independent research project or related field work in an approved topic in urban planning, community environment, ethics and sustainability. A completed bachelor’s degree arms graduates with more earning power over their working lifetimes than for those who haven’t completed college. In 2013, bachelor’s degree holders took home median weekly wages of $1,199 — more than $450 per week over pay made to workers with only a high school diploma (U.S. Bureau of Labor Statistics, BLS). In addition to increased earning potential, bachelor’s degrees provide graduates with job security in tough economic times. A 2013 study conducted by the PEW Charitable Trusts found that while 21–24-year-olds suffered wage and job cuts during the severe downturn in the economy, 2009-2009, those with bachelor’s degrees fared exceptionally better than workers without a post-secondary degree. Wages for four-year graduates shrank by less than half the amount of the pay cuts suffered by workers with only a high school diploma. Similar disparities were found in job cuts; jobs of bachelor’s graduates dropped two percent during the economic downturn, while positions for workers with only high school diplomas fell by twice as many (four percent). A bachelor’s degree program is a common way for students to complete a well-rounded education that can prepare them for careers beyond entry-level service occupations. Many employers require applicants to hold a bachelor’s degree with a major and skills that match their job requirements. For some students, the bachelor’s degree serves as an educational bridge to an advanced degree program. Most states require public school teachers to complete a bachelor’s degree as a minimum entry requirement for classroom work. Campus and online bachelor’s degree programs offer great opportunities for students who have only taken a few college-level classes or have completed an associate degree that want to transfer and complete their four-year degrees. Major and minor subject fields offer broad class selections across the entire range of bachelor’s degree programs. Students who have completed an associate degree may change directions entirely to pursue a four-year degree in another major field. Students transferring from an associate degree program to bachelor’s studies, or students changing four-year colleges, must take special care to ensure they receive credit for previous classwork. Academic advisers and degree counselors are go-to resources in considering a change. Many four-year schools have transfer arrangements with community colleges in their states or communities. Not all courses are treated equally by academic transfer committees. Community college students intending to transfer should start from the first semester to determine which course of study will best-meet core and general education requirements required by their four-year school. Students changing bachelor’s degree institutions may risk losing previous credits for studies outside standardized general education courses. Often students are disappointed to discover that they cannot afford to relocate to attend college or live too far away to commute. They may be saddled with employment or family responsibilities that make attending full-time, on-campus programs impossible. For them and others, online bachelor’s degree programs are convenient alternatives, with their flexible class hours and 24/7 remote access from any device connected to the internet. Because they are self-paced, many online bachelor’s degree programs may be completed in less than four years. Students will find an extensive selection of online colleges, universities and for-profit schools that confer bachelor’s degrees. Online educational technology is advancing as quickly as innovations can be built into college interfaces. Students enroll, register, receive academic counseling, attend classes, complete assignments and tests, and hold conferences with their professors without leaving their home, office or nearby café. Classes are presented through multi-media presentations, live and recorded lectures, instructor blogs, email and threaded communications, video and voice conferencing software. Students have round-the-clock access to online libraries and resources for conducting research. Must I be a nerd to use an online classroom program? Students who are reading this right now have all the skills necessary for accessing their online degree programs. Where other tools are used (such as video conferencing), there are help pages, technical support staffs, and peers to show them the ropes. What is the quality of online classes compared to on-campus ones? Most online teachers and professors hail from the campus college environment. In addition, accredited online degree programs have been evaluated by independent researchers to ensure that they meet standards for academic quality and course delivery. What happens to students who have to complete laboratories in addition to attending online lectures? Distance educators understand the reasons why students choose online schools. To that end, they create labs that can be completed entirely online or they schedule labs with participating organizations close to where students work and live. Is student aid available for online students? Online bachelor’s degree institutions that hold formal accreditations are eligible to offer qualified students the package of federal student loans, grants and work study options. Will I miss the social aspects of a college education if I’m only online? Online students may miss football games, pep rallies and campus activities, but they’re not paying for them! And because students have a limited time to study, online programs allow them to devote themselves to completing their degrees. Online students frequently report that they build lasting friendships and academic interests with their fellows through class chats, emails and conference calls. Colleges, university and online schools that offer bachelor’s degree programs stake their reputations on voluntary accreditation. The process involves a college self-assessment followed by a campus visit by an independent accreditation agency. Agencies are approved by the U.S. Department of Education. A formal accreditation evaluates how the college performs in areas of academic quality as defined by national standards organizations. The Council for Higher Education Accreditation (CHEA) currently identifies more than 20,000 accredited academic programs across the United States. Accreditation can be granted for an entire school or college, or individual college programs can receive specialized accreditation. College departments may seek accreditation from professional associations if they are delivering career-focused coursework. Campus-based programs typically seek regional accreditation of their degree programs from one of six agencies. Online colleges and traditional colleges offering online classes often obtain a regional accreditation as well as a specialized online accreditation from agencies such as the United States Distance Learning Association or Distance Learning Council. Students requiring financial aid should investigate accreditations at their prospective colleges and universities. The U. S. Department of Education requires schools that offer federal financial aid (grants, loans, fellowships) to hold current accreditations.